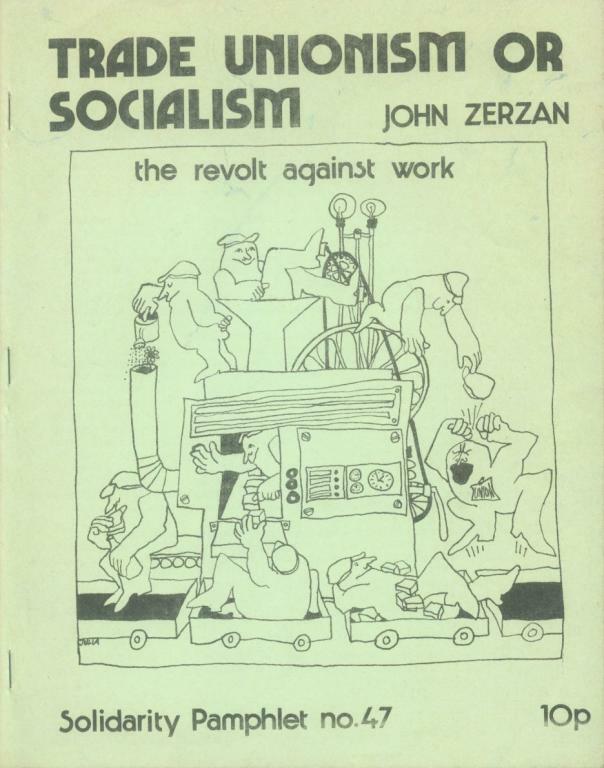 This pamphlet comprises two articles written by John Zerzan. The first originally appeared (under the title 'Organised labour versus the revolt against work') in the autumn 1974 issue of the American radical publication Telos. It was later reprinted by Black and Red (P.O.Box 9546, Detroit, Michigan 48202, USA). So far as we know the second article has not yet been published. The articles document important aspects of working class struggles in the USA, during the last two decades. 1 Unlike so many who get involved in working class history, the author lays emphasis throughout on what ordinary workers are thinking and doing — and maintains a welcome and crystal-clear differentiation between the working class and 'its' organisations. He does more, however. He shows, with a wealth of factual evidence, how the trade unions are now not only 'objective' obstacles to working class struggle but cynically conscious agents of the Establishment. In no area has the conflict between workers and unions shown itself more clearly than in the struggle over working conditions and attitudes to the work process. In advanced industrial countries the pattern has repeated itself over and over again. The unions negotiate wage increases, retirement benefits, etc. Employers (who are at least as concerned to maintain their dominant position in the relations of production as they are to maximise surplus value immediately) make concessions on the wage front, seeking in return 'no-strike pledges' or other guarantees of 'peace' in their plants. The unions do not take up questions of speed-up, manning and the assignment and lay-out of work, considering these issues to be managerial prerogatives. But it is precisely in these areas (which are central to the real working life of working people) that meaningful challenges to capitalist production are developing on an increasing scale. No wonder the workers come into bitter conflict with 'their' unions. The author deals with many important changes which have taken place over the last 20 years. He describes the increasing centralisation of union structure (rendering increasingly ridiculous the old anarcho-syndicalist parrot-cry of 'One Big Union'), the progressive institutionalisation of Government-labour ties, the real roots of working class 'apathy' in relation to union matters (his analysis here closely resembles our own, outlined in Modern Capitalism and Revolution), the growth and developing consciousness of the 'unofficial' movement in industry, the growing tendency of workers to reject labour contracts negotiated 'on their behalf' but without their knowledge or consent, the 'turbulent rejection of organised union authority among young workers', and the almost 'unanimous contempt for work'. He shows how 'active resistance is fast replacing the quiet desperation' formerly felt by many. All these facets of industrial life have been well known to thinking militants for some time, but gain vastly in credibility and impact as a result of the massive documentation provided. What is really new in Zerzan's articles is the collection, in a couple of texts, of so much information concerning the shared attitudes (on questions of industrial struggle) of sophisticated employers and modern union officials. With chapter and verse the author demonstrates how often union and management today agree on the necessity for a strike. A Wall Street Journal article (October 29, 1970) openly discussed the issue. The U.A.W. recognises walk-outs as 'an escape valve for the frustrations of workers, bitter about what they consider intolerable working conditions'. Intelligent management concedes that 'union leaders need strikes to get contracts ratified and to get re-elected'. As far back as 1952 a sociologist was advising management that 'yearly strikes should be arranged, inasmuch as they work so effectively to dissipate discontent'. 2 The advice seems to have been taken increasingly seriously. No wonder that for the duration of the ten-week strike at General Motors, in the autumn of 1970, the Company was prepared to loan the union $23 million per month. The 'cathartic' effects of strike are openly discussed by union leaders. They also discuss how to organise the defeat of strikes they don't want. When the leaders want a strike they now gain strange allies. State power may be used to 'protect the spectacle of union strikes'. Reference is given to instances where police joined union leaders on the picket line ... to help keep scabs out. The conventional, union-led strike is correctly seen as 'ritualised manipulation' which alters little or nothing about working conditions or the nature of work. In 1935, in the heyday of the Roosevelt era, the Henderson Report counselled that 'unless something is done soon, they (the workers) intend to take things into their own hands'. 3 Something was done: the hierarchical, national -unions of the C.I.O. appeared on the scene. Relations were stabilised. In the 1970's far-sighted, management is prepared to grant, some form of participation in decision-making, again seeking to prevent workers from 'taking things into their own hands'. We have not however conducted systematic propaganda against workers belonging to unions as such, considering such a discussion an irrelevance and a diversion from the real task of building rank and file organisations. Has the time now come for a change of attitude? And, as reality is always concrete, what would a new attitude imply in practice? What would it mean once one got beyond the realm of slogans? What would one say, specifically, in the wide range of work situations pertaining in Britain today, from the non-unionised sweat-shop to situations where union membership is required by management as a condition of employment? We hope readers will join us in this important discussion. In Telos, no 21, I discussed the ways in which trade unions enforce the workers' lack of control over their lives on the job. Cited as a typical occurrence was the response of the United Auto Workers to a wildcat strike at the Mack Avenue Chrysler plant in Detroit in the summer of 1973: large crowd of union officials and committeemen, armed with baseball bats and clubs, forced the workers back to their job. The conservative nature of official strikes, the growth of union centralization and autocracy, and the increasing institutionalization of business-labour-govemment collusion and cooperation were discussed, against the backdrop of such manifestations of heightened workers resistance as rising absenteeism and turnover rates, declining productivity, and a much greater anti-union tendency. Events in 1974 have confirmed these observations and call for even more explicit conclusions, in my opinion. "Many workers feel alienated from the political process and with little real control over their lives. If the right to approve the contract they will have to work under for two or three years is denied them, how will they react? What directions could their frustrations take? We are dealing here with a question of national stability and that question's importance is overriding." A sophisticated union leader, Beirne realized the critical value of the strike in releasing pent-up worker pressure and thus serving as an invaluable cathartic or safety-valve. In fact, as Stanley Aronowitz mentioned in False Promises, the wildcat strike can also serve as a welcome remedy, in the eyes of management. This is not to minimize the impact of certain wildcat struggles. For example, June, 1974, saw a protracted wildcat at the Ford stamping plant in Chicago over conditions on the job, and a walkout at the Warren, Michigan Dodge truck facility that was suppressed by UAW officials with the help of a bull-horn-equipped judge. But it is also true that use of the strike in undercutting worker unrest is receiving an ever-wider appreciation. Developments in 1974 show clearly that there is much concurrance with Gordon Taylor's advice to management everywhere that yearly strikes should be arranged, inasmuch as they work so effectively to dissipate discontent. 7 The Supreme Court, for example, ruled in June that the Letters Carriers union could not be sued for publicizing the names of non-strikers and labelling them "scab", because the epithet was a "literally and factually true" statement. And as the Court upheld the use of that divisive sobriquet, more community officials have lent their sanction by voting welfare benefits to strikers for the first time. A.H. Raskin's "Are Strikes Obsolete" (Saturday Review, October I9, 1974) describes the loss of sanctity of strikers' picket lines in the eyes of workers. Though deficient in most respects, Raskins article accurately reflects a growing dissatisfaction with the narrow demands of conventional strikes. Also in June the National Labor Relations Board expanded union authority in a precedent-setting decision that gave unions disciplinary powers over supervisory personnel union members in strikes. The pattern is ever-clearer; as union, management, and government leaders strengthen the strike as an institution, more workers see through their own manipulation. But if the globalization of union structures is the trend, so is the steady diminuation of rank and file influence over the union monoliths. The recent evidence is quite supportive in this area of eroding worker autonomy. In May, the National Commission for Industrial Peace, which included the presidents of. the United Auto Workers, Teamsters, Seafarers, United Steel Workers, and the AFL-CIO, issued its report, which mainly recommended scrapping the 1959 Landrum-Griffin Act. The Commission agreed that "unions and their officers have been attacked in legal proceedings, that they have tended to become shy and not to exercise the leadership and general, responsibility" owing to the oppressive Landrum-Griffin Act which enables "small numbers of dissidents to prevent settlements and cause unwarranted turmoil." 10 It is likely that this law will be revised, removing any clauses protective of the rights of union members. The Federal Mediation and Conciliation Service released figures in July which gave credence to the union leaders' annoyance at their unruly memberships. The Service reported that 12.3% of tentative contract settlements were rejected in the previous 11 months, the highest rejection rate since 1969. At the United Auto Workers convention in June, union representatives voted to lengthen the terms of international and local officers from two to three years, a move thoroughly unpopular with the rank and file. In July, New York Times and NY Daily News printers voted for an historic II year contract as other unions tired of the strike farce, walked through the Typographical Union picket lines. Also in July, Southern Californian carpenters narrowly approved a 3 year contract when AT&T granted it full "agency shop" status in which all employees will be compelled to pay union dues, like it or not. The big CWA newspaper ads were very accurately, signed, A NATIONAL UNION IN THE NATIONAL INTEREST. A Wall Street Journal survey of truck mechanics showed that "revolt against work" attitudes are not confined to younger workers, but in fact were stronger among 45-54 year age group. 12 A few weeks later, the Postmaster General reported that absenteesim soared among postal workers in fiscal year I974. 13 In November, during negotiations with the United Mine Workers union, coal industry spokesmen readily offered much higher wages in return for a "reduction in wildcat strikes and absenteeism" to ensure higher productivity. 14. National productivity has been falling part due to the massive dissatisfaction so evident. Even greater labor-management collusion has been the main response, in an effort to reverse the sagging per-capita output. The Construction Industry Combined Committee and the Five Pact Labor Alliance, representing management and unions in the St. Louis area, and the Productivity Committee in New York, representing the city and major unions, are examples of joint productivity drives. On Labor Day, President Ford called for a "new struggle for productivity" and in the same month RCA Corp. Chairman Robert Samoff was the keynote speaker at the International Brotherhood of Electrical Workers convention, exhorting the IBEW to push for "greater productivity." The huge productivity campaign of US steel and the United Steel Workers union has operated in high gear throughout 1974, utilizing full-page ads in magazines and newspapers, and other major propaganda efforts, with dubious results. And as these campaigns and countless management and personnel polls and studies proliferate, the slogan "job enrichment" is increasingly heard. Swedish firms have been among the most publicized in their efforts to achieve more efficient production via job reforms. Their success is in grave doubt, however, with Volvo's Torslunda plant experiencing a daily absentee rate of 18% and worker turnover in Swedish industry overall at 30% a year. British Columbia's deputy minister of labor, to cite another source, said in the fall that his New Democratic Party is searching for "new ways to reduce the industrial conflict" in British Columbia, citing experiments in "worker control." As the problem for capitalism deepens, there are seen more and more efforts to reform the unions, notably by ever-present leftist sects and their "caucuses". Yet perhaps the time has finally come for the supercession of the manipulative theory of "extra-union" struggles, in favor of a frankly "anti-union" revolutionary approach. Anton Pannekeok, writing in the Twenties, declared, "It is the organizational form itself which renders the proletariat virtually impotent and which prevents them from turning the union into an instrument of their will. The revolution can only win by destroying this organism, which means tearing it down from top to bottom so that something quite different can emerge." And today the awareness that trade unions are, in Glenn Browton's phrase, "inherently oppressive," seems to be spreading everywhere. Those who consider themselves radicals are thus encouraged to catch up with the actual movement of the working classes. 2. Gordon Taylor, 'Are Workers Human?' (Houghton and Mifflin, Boston, 1952) p.177. 3. William Serrin, 'The Company and the Union' (Knopf, New York. 1973), p. 118. 4. For a detailed discussion of the difference between 'workers' control' and 'workers' self-management', see the Introduction to M. Brinton's 'The Bolsheviks and Workers Control 1917-1921'. 5. David Jenkins, 'Job Power' (Doubleday, Garden City, N.Y., 1973) p.312. 6. See Motors and Modern Capitalism (Solidarity vol.III, no.12); *Participation: a trap (IV, 6); For a Socialist Industrial Strategy (IV, 10); *Trade Unions: the Royal Commission Reports — the story of a nightmare (IV, 11); The ambiguities of Workers Control (VI,6); *Unity for ever ... with the Institute of Workers Control (VI, 7) and our pamphlets What Next for Engineers? (no. 3), The Standard Triumph Strike (5), The BLSP Dispute (8), Truth about Vauxhall (12), Busmen What Next? (16), Mount Isa (22), What Happened at Fords (26), *GMWU: Scab Union (32) and Strategy for Industrial Struggle (37). Items marked with an asterisk are still available: 10p + postage. 7. Gordon Taylor, Are Workers Human? (Boston: Houghton, Mifflin, 1952), P. 177. 8. Letter from Burke to Jacob Stephen, November 14, 1933. 9. Wall Street Journal, September 17, 1974. 10. Report to the President of the National Commission for Industrial Peace (Washington: Bureau of National Affairs, May, 1974), p. 4. 11. Louis Lundborg, "A Banker's Rejection of Our Rapacious Economy", Los Angeles Times, July 14, 1974. 13. Los Angeles Times, August 25, 1974.